Pearl & Crystal Bracelets - HEY JULES! 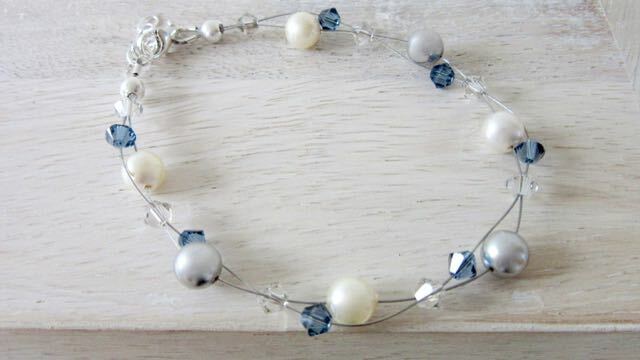 This piece is made from 6mm Swarovski cream pearls and azure crystals, with sterling silver clasp and extension chain. This bracelet can also be made in other colours, please contact us to discuss your bespoke options. 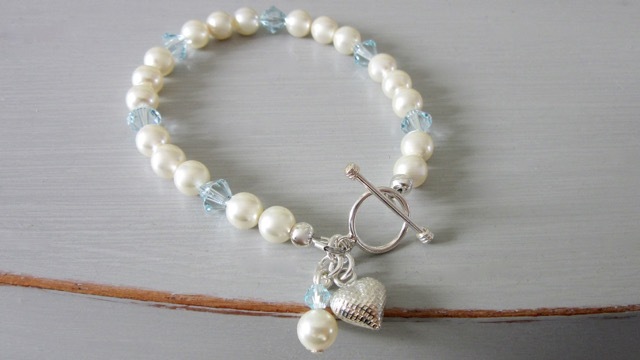 This piece is made from 6mm Swarovski cream pearls and azure crystals, with sterling silver clasp. It has a sterling silver dotty textured heart and a pearl and crystal charm. This design is similar to the Forever design but has small antique pink crystals which are left free to 'move'. It's a really pretty and delicate look, and ultra feminine. This design has cream, ivory, and silver pearls with denim blue and silvery toned crystals, all Swarovski elements. It has a small extension chain to ensure a perfect fit.